Every Mondays and Fridays of June and July we will be featuring some my favourite food bloggers for the first time here at Ang Sarap. These bloggers are exceptional and served as a big influence of what is Ang Sarap now, so please do visit and follow every one of them (if you haven’t yet) and I will assure you that you won’t be disappointed. Our guest for today is Sam from Sweet Samsations. Sam is originally from Singapore and now living in Vancouver, her specialty are sweet treats so if you are looking for something sweet well look no further as Sam’s blog is a treasure trove of goodies like this 8-Layered Double-Crusted Red Velvet Cheesecake, Layered Orange Chiffon Cake with Ganache and Mango Cheesecake Cheesecake with Coconut Macaroon. Though most of her posts are for those who have a sweet tooth, once in a while she also post some great savoury dishes just look at this one top chef quality Bacon Wrapped Halibut with Roasted Vegetables and Beurre Blanc and this one Turkey Sausage Lasagna, do I need to say more? Those exceptional post combined with great photos I think are enough for this introduction so let’s all welcome Sam. Hello folks! My name is Samantha, better known as Sammie, and I author Sweet Samsations. Amongst the many hobbies I have, such as photography, hot yoga and playing the piano, my biggest passion lies in baking! My kitchen is both a sanctuary and a playground for me where I can experiment with fusion dishes as well as attempt to replicate traditional ones. Since I was little, I was exposed to a multitude of different Asian cuisines, from sweet to spicy (and everywhere in-between). This diverse range of “foodism” has expanded in Vancouver, where I can try every sort of food imaginable. My experience here with exotic foods has fostered a versatile and diverse palette for various cuisines, as well as a love to experiment with new dishes! When I received Raymund’s email to do a guest blog posting, I was both thrilled and honoured! I’ve always been a fan of Filipino cuisine and Ang Sarap is my “go to” blog whenever I had a recipe in mind. I love how he explained the origin of each dish and then proceed tempt me with his wonderful photography and culinary skills! When I was asked to create a dish representative of my culture, I was torn between my two halves. I’m of Southeast Asian descent – namely Singaporean and Indonesian. Although the food in both countries are largely similar and carry heavy influences which were sometimes based off one another, they also differ in many aspects. Like all other cuisines, each is unique and boasts their own signature dish. Mix in coconut milk mixture and allow to rise for 1-2 hours in a warm place. You should be able to see a lot of holes forming on the top. Preheat the skillet or griddle with LOW HEAT. Grease the pan and sides with a little margarine. Pour the batter, cover and cook until you can see bubbles start to form. This will take approximately 10-15 minutes or until top is full of holes. Ensure that your heat is LOW so that the skin doesn't burn. The level of the batter should not exceed half the height of the skillet. Mukang masarap yan pre ha…. Hi Sammie! Nice to meet you – these pancakes are exactly what I need at the moment. Although chocolate and cheese? Never heard of that combo. Must try (bananas and ketchup sound weird too but taste good). Hi Martyna! Nice to meet you too! Yes!! Chocolate and cheese is actually a very delicious combination! You won’t even taste the saltiness of the cheese! We love adding lots of cheese to sweet Asian desserts like this (and also the Cassava Cake)! The chocolate will overpower it and you won’t even taste the “savouriness” of the cheese. But it will add so much flavour! Do try it! 🙂 As for banana and ketchup… mmm.. haven’t heard of that combination yet! haha.. But I’m sure I’d be able to find some interesting recipes online for that! Just a note on this one, in the Philippines we even have banana ketchup’s which we use in sweet style spaghetti. These pancakes are perfect to put my day on right track!!! Nice meeting you Sam, and once again wonderful guest post Raymund!! Hi Reem. Thank you so much! Nice meeting you too! I’m glad you liked them! I could honestly have these every day! haha.. This looks fantastic Sammie! If they sold these as street food around here I’d be in so much trouble. 🙂 And I love hot yoga too! Raymund – another great guest post! Thank you Kristy!! haha.. Yes! They are so tempting especially when street foods in Asia are very affordable! 🙂 I do Bikram’s! It’s my favourite. I wonder if you’re doing the same one too! haha..
Looks delicious! This would be perfect with milk chocolate sprinkles :). Thanks Tessa! Actually the brand I recommended “Ceres” is the milk chocolate sprinkles you are referring to! Those are my favourite!! Unfortunately I only get to stock up whenever I go to Indonesia! haha.. I like the idea of sweet or savory fillings- today we had a “build your own crepe” party at work and had different ideas for the fillings- nutella, fruit, peanut butter, chocolate chips, etc. delicious! Thanks Meri! Oh yummy!! All your description of the fillings is just starting to make my mouth water… haha..
Raymund – Thanks for introducing us to Sammie! Sammie – nice to meet you! I can’t wait to head over to your blog and check out your sweet sensations. The ones your sharing here are fabulous! Hi!! Nice to meet you too!! I’m glad you enjoyed this one!! 🙂 Will definitely check out your blog as well! Yup!! That’s the Malaysian variation! They’re definitely similar! I believe they even use the same type of pans! 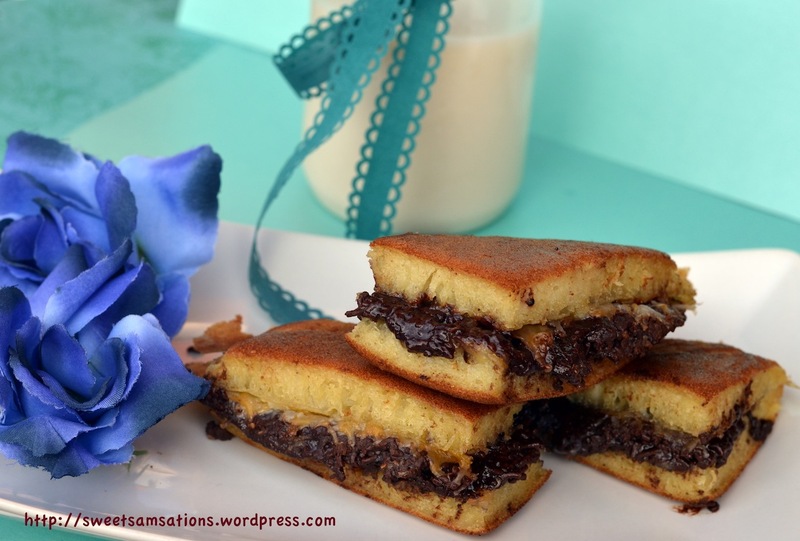 But Martabak Manis is usually a little thicker and I believe Apam Balik filling consists of mostly peanuts… right? hahaha.. But yes very delicious too!! Awesome guest post by Sammie..love her blog, and love these pancakes! Thanks Lisa!! You’re the sweetest! Whoo whoo Sammie is here. So happy to see her post, with this delicious treat! I’d never had the choco & cheese combination in my life. I assume chocolate is strong that we can barely taste cheese? Not sure but curious! Thanks Sawsan!! I’m totally in love with your blog too!! Glad to discover another amazing food blogger!! Thanks so much Geni!!! Love visiting your beautiful blog too! Hopped over from Sammie’s blog. 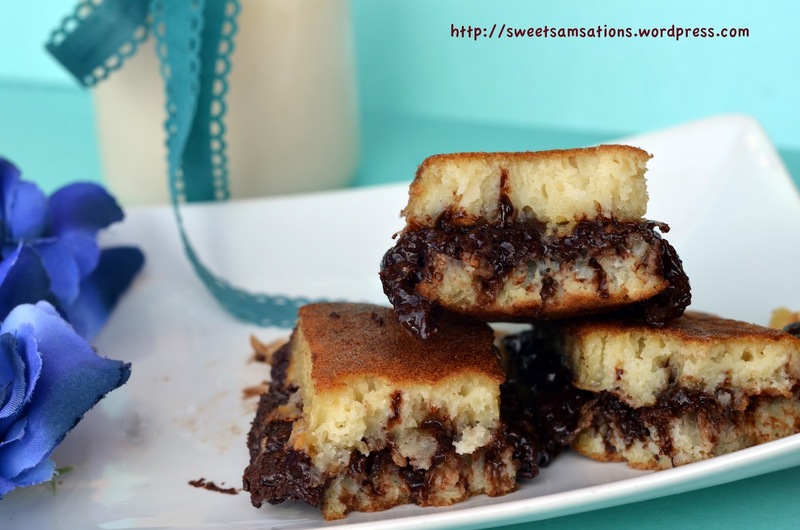 Love her blog and this pancake with the soft and chewy texture sounds really delightful. hehe.. I’m only half Indonesian. But I do have an Indo last name! 😀 You are welcome Yudith my dear! Hope you like it!